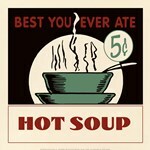 Soup and salad art encompasses many different artistic styles including pop art, realistic still life art, and graphic design. 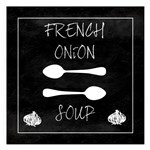 These framed soup and salad paintings add a warm touch to any environment and are widely used in restaurants, homes, and cafes. Because of the variety entailed in the subject matter, modern artists are constantly discovering ways to reinvent this unique art category. 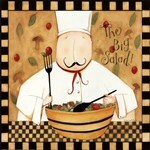 Although soup and salad art is in the same art category, the artwork that depicts these subjects generally only shows one or the other. This is largely due to the different themes these objects embody. 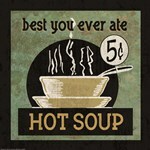 Soup art, for example, is commonly used to display themes of fine dining, warmth, and comfort, as seen in the work 'Hot Soup' by Erin Clark. Salad art, on the other hand, is more diverse in its forms of expression and generally represents the ideals of domesticity and the diversity of nature's bounty. Many acclaimed modern artists make use of this art category. Surreal culinary art, as seen in Greg Brown's 'Reclining Salad' and 'Salad Bar' help to redefine how viewers look at and interact with their food. 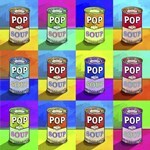 Also, Andy Warhol's Campbell soup art is one of the most identifiable examples of soup and salad art in the world today. Although a few traditional artists employed soup and salad art in their works, such as Caravaggio in his salad painting 'Still Life', modern artists have truly made this art category their own. From commercialized retro paintings to heartwarming surrealism, soup and salad prints warm the heart while delighting the eyes.